German historian; born in Breslau May 22, 1834; died in Göttingen Jan. 13, 1871. He belonged to a prominent family of merchants. Physically deformed as the result of an illness in childhood, he was taught by his mother till he was over eight years of age, when he went to the Magdalen Gymnasium. He entered Breslau University in 1851, and Berlin University in 1853. About this time he was stricken with a serious illness. During his slow recovery at Breslau he attended lectures by Mommsen and Junckmann, and he took his degree at the university of that city in 1856. 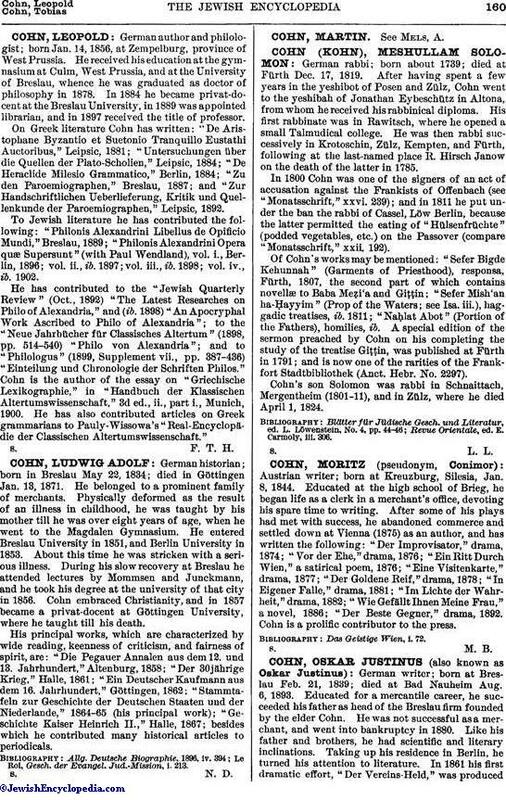 Cohn embraced Christianity, and in 1857 became a privat-docent at Göttingen University, where he taught till his death. His principal works, which are characterized by wide reading, keenness of criticism, and fairness of spirit, are: "Die Pegauer Annalen aus dem 12. und 13. Juhrhundert," Altenburg, 1858; "Der 30jährige Krieg," Halle, 1861; "Ein Deutscher Kaufmann aus dem 16. Jahrhundert," Göttingen, 1862; "Stammtafeln zur Geschichte der Deutschen Staaten und der Niederlande," 1864-65 (his principal work); "Geschichte Kaiser Heinrich II.," Halle, 1867; besides which he contributed many historical articles to periodicals. Le Roi, Gesch. der Evangel. Jud.-Mission, i. 213.